Sham is situated in lower Ladakh with beautiful landscape, villages and monasteries. This is a soft trek and we have ample time to explore Buddhist culture and monasteries pre and post trek. Besides we admire the site of Delhi, Taj Mahal - the marble wonder and Rajput highlight of Jaipur. Morning arrive Delhi and transfer to hotel. Afternoon combined guided tour of Old and New Delhi includes Jammia Masjid Mosque, Cycle rickshaw ride through Chandni chowk, Red Fort, drive through India Gate and Parliament house, Qutab Minar and Humayuns Tomb. Morning transfer to airport and fly to Leh, arrive and transfer to hotel. Rest of the day at leisure for acclimatization. Leh is a small picturesque town of about 10,000 people. Situated at 3505 Mt. (11500 ft), the summer days are dry and sunny but nights can be cold. A double lines of "Manies", stone shelters for departed spirits, protects the towns approaches. During these three days we will explore some of the interesting monasteries of the area. Morning sightseeing of Stok Palace � The palace has a small museum, which houses the queen�s head gear (peyrak) and a remarkable collection of Thankas. Tibetan children�s village. Shey Palace � Shey was once the capital of Ladakh in the pre � Tibetan era until the 15th century. Thiksey � Tsong Khapa had prophesied that a monastery would be built here and Thiksey was founded by one of his disciple Hemis - largest monastery founded in 1602 by Tagtsangrepa and Tatok � this monastery of the Nyimapa order has about 50 monks and these not far from Chimiri, Padmasambhava, the founder of the order is said to have meditated here. DAY 04. LEH � LIKIR Drive 61 Km 2 Hrs. Morning transfer by car / jeep to Liker, en-route visit Spituk - The monastery first belonged to the Kadampa order but in the 15th century it was restored and Tsong Kapa sent two Lamas to transfer it to Gelupa order. Phyang � founded in 16th century by King Tashi Nangyal. Arrive and camp for overnight. After breakfast we explore Likir Monastery, located at a distance of 5 km from the main road, just before Saspol. It is a magnificent gompa, overlooking the village of Likir. It is also known as the Klu-Kkhyil (water spirits) Gompa, it was founded in the 14th century, and was the first gompa in Ladakh known to have been built under the direction of Tibetan monks. DAY 09. THEMISGAM � LEH Drive 100 Km 3 Hrs. 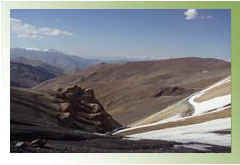 After breakfast drive to Lamayuru, explore the monastery and return to Leh, en-route visit Alchi Monastery. Arrive and check in at hotel. Lamayuru lies 125 Km. away from Leh at the foot of Fotula Pass (The highest point on Leh Srinagar highway). The m onastery is one of the oldest and major monastery of western Tibet and stands on a small hilltop overlooking the enchanting landscape. Above the monastery stupas and mani walls mark out the old carvan route. The monastery is worth visiting and houses many status Avalokeshwara and guru Padama Sambava. 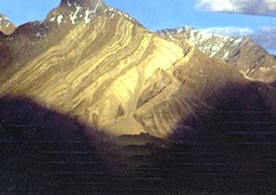 Alchi situated on the left bank of river Indus, 69 Km. 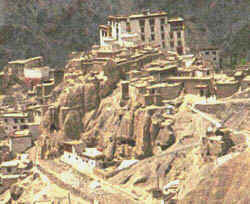 away from Leh is the village and monastery. The monasteries date back to 11th and 12th century. The statues are made of mud and are beautifully painted in typical Kashmiri tradition, which was very influential that time. The temples with wall paintings are Dukhang or meeting hall, the three storied statue of Sum-tseg and Majushri are worth admiring. The mural paintings of Mandala and Maha Kala are match less to all the monasteries of Ladakh. Morning transfer to airport in time to catch Delhi ound flight. Arrive and transfer to hotel for overnight stay. Rest of the day at leisure for personal exploration. DAY 11. DELHI � AGRA Drive 202 Km 4 Hrs. Morning depart and drive to Agra, en-route visit Mathura the birthplace of Lord Krishna and the tomb of Emperor Akbar at Sikandra. Arrive and check in at hotel. Afternoon visit Taj Mahal, and Agra Fort built by Emperor Akbar as his citadel over the years 1565 - 73. DAY 12. AGRA - JAIPUR Drive 231 Km 5 � Hrs. Morning depart and drive to Jaipur, en -route visit deserted city of Emperor Akbar at Fatehpur Sikri. Arrive and check in hotel. DAY 13. IN JAIPUR Morning 11km. drive to former capital Amber, up hill elephant ride to admire the massive gateways, courts, stairways and pillared pavilions / palaces. Return to hotel for lunch. Afternoon explore City palace, Observatory, Hawah Mahal (Palace of winds) and bustling Bazaar. DAY 14. JAIPUR � DELHI Drive 258 Km 5 � Hrs. Morning drive to Delhi, en-route brief halt at midway for refreshments. Arrive Delhi by lunchtime. Arrive and Check-in at hotel. Rest of the day at leisure for last minute shopping and personal activities. Morning transfer to airport for homeward flight.